Asked why he thinks the war against Boko Haram can be won in six weeks even though the war had raged for six years. The president said he has just acquired new weapons, and gotten support of neigbhouring countries to fight Boko Haram. He mentioned that Chad waited for African Union approval, which they recently got too. He also mentioned that the issue of security is beyond Boko Haram. The president said it runs into dangerous signals of youth restiveness. Asked if he has confidence in Jega to conduct the 2015 elections. The president said he wished Jega was seated by his side to answer the question. One of the interviewers interjected that he (Jega) is watching. He blames his supporters for rumours about Jega’s resignation. “I have not told anybody that I will remove Jega,” he said. He explained that if there are obvious reasons to remove Jega, he would rely on “constitutional” provisions that gives him powers to sack whoever he appoints. On Jega: I wish Jega were here, I could have asked him to answer whether I have confidence in him Yes those who called for his sack may be close to me, but they express their own opinion. More than 80 per cent of those who sponsor messages on our behalf we don’t even know them. People use the reschedule of election to misinform Nigerians. I have never thought about removing INEC Chairman, though I have the constitutional power to do so. The next question is about hate speeches and political violence by both opposition and ruling party members. The president explained that “some people” get carried away by the political play and exude these violence. He blamed aides and associates of key political actors for the hate speeches and political violence. He did not categorically condemn the hate speeches or war threats or politically-motivated violence. “We will make sure things are done so that nobody goes to war,” the president said when he pressed for categorical stance on the war threats by ex-millitants should he lose the elections. He argues journalists have responsibility to ensure the unity of the country. Asked why he has been going to churches frequently for campaign but never visited mosques. He said churches have been inviting him but he has not gotten any invitations from mosques. Asked if election would hold should the military fail to eliminate Boko Haram in six weeks. The presidents said the new dates are scrosanct and a new president would be sworn in by May 29. He argued that the goal is not to totally eliminate Boko Haram but to make adequate security arrangement for the election. Asked why he has not handled the case of the missing Chibok girls effect enough. He said he made that statement quoting the former Chief Justice of Nigeria, Dahiru Mustafa, who explained to him that his analysis of corruption cases in Nigeria showed that most of such cases were theft. Chibok Girls: I belief the story of Chibok Girls will get better in the next few weeks, but don’t quote me. We are working with our neighbours, we will comb the whole of that place Partying after abduction? It’s unfortunate that people play politics with the issue of Chibok girls. It’s not like that elsewhere. In other countries, political boundaries collapse in the face of terror attacks, not so in Nigeria. He said the government have not started disbursing the N1 billion loan. With regards to the .3 million arms money seized in South Africa, he said the money does not belong to Nigeria, technically. He added that the matter was in court. We have convicted more corrupt people than ever. It is just that Nigerians are confused on what the difference is between stealing and corruption. Asked where he bought arms for the coming onslaught on Boko Haram. The president said they managed to get from other sources other than America. Asked if he would hand over if he loses the next election. “If the elections are conducted and I lose, of course, another president would be sworn in,” the president said. He argued that Nigeria is more important than any individual. Answering questions on security, the president said Boko Haram is faceless and factionalized. Asked what he will do differently if he wins the election. Mr. Jonathan said most of the problems he had in the past is related to perception and not concrete. He did not really say what he would do differently. Asked to comment on his opponent for the 2015 general election. The president said it was an unfair question. He added that he has received more criticism that Muhammadu Buhari on social media. Asked if he has confidence in INEC as presently constituted. He said he appointed all the management staff of INEC. Speaking of stories in the media, he said most of the information they published are distorted. 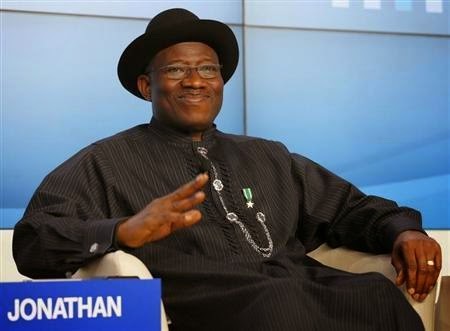 In his closing, president Jonathan assured Nigerians that elections would be conducted and a new president sworn in on May 29.